Panini Playbook Football is back again this year. It's been a pretty popular product for the last couple of years. The main draw of Playbook is the fact that these boxes guarantee a book card in every box. Book cards used to be very desired card types, but there have definitely been diluted as the years have gone on. Panini changes Playbooks configuration this year. Let's see if it works out for the better. Playbook is a completely concentrated product of hits. That's all you get... and you only get two per pack/box. Each box will come with two cards - one auto and one relic. The relic card I pulled in my box was a Monte Ball Down & Dirty card numbered to just 25. It's a good looking card with a decently dirty jersey - but not filthy. There are Down & Dirty patch cards that are absolutely spectacular. I do like the fact that these jersey pieces have game-used elements to them - it's a really nice draw. Some rookie booklets just feature event-used jersey pieces. I wouldn't be happy if that was what I ended up with. 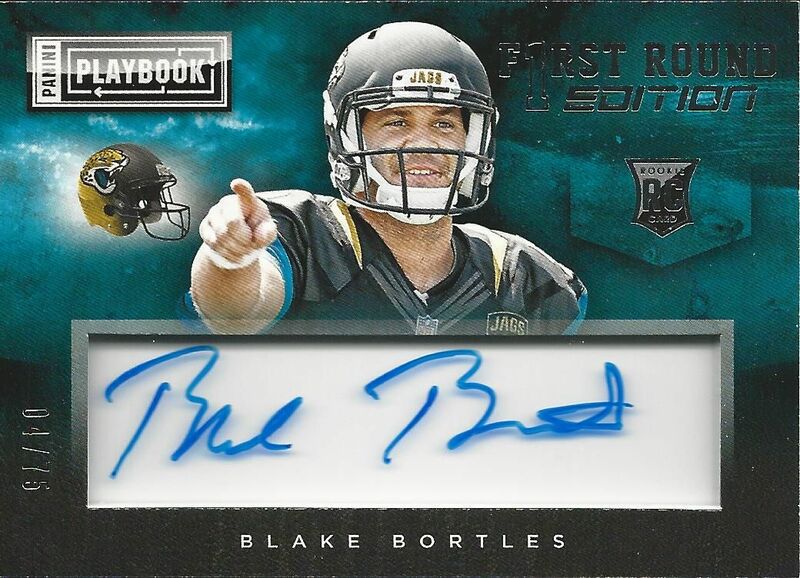 For my autograph, I pulled a pretty nice Blake Bortles autographed card. Panini seems to really like the autograph on the acetate. I could do without it as the autograph can be pretty hard to see. If the auto was on white stock, I think it would sand out much better on this card design. Overall the card look good, but it doesn't feel like a traditional rookie card at all. Because Playbook is has only two cards per box, the price has dropped on them. You are paying quite a bit for just two cards. I'm not sure what the future looks like for Playbook. Book cards are just saturating the market now. Not many collectors are happy getting plain jersey books. Hopefully Panini will see this and find a way to cut down on books or make them of better quality rather than simple jersey cards. The Down & Dirty idea is great, but only so many cards have that kind of use shown on them. Hopefully there won't be a 'Squeaky Clean Gear' card with jerseys worn only during a photoshoot. Though many of these cards are already just that. Unless you're a huge fan of books or you're feeling really lucky, I probably wouldn't purchase too much Playbook this year. For almost a hundred dollars you're just getting two cards it's a big risk for very little product. And I've heard collectors complain about finding Hot Rookie Autographed cards in the packs as the auto card. That really should have been a bonus in my opinion. I didn't like playbook in hockey and I still don't like it in football. Its such a high risk product and to me the cards aren't that nice or of that high a quality. + Many of the cards looks really nice, especially the patch versions of the Down & Dirty cards. - Paying 100 dollars for two cards is way too much! Cards looks great but imo to overpriced for just a few cards! One of those products that'll be a great pick up in a firesale when collectors don't bite for the initial price. And yeah, booklets are OVERDONE. The thrill is gone when there's too many plain jersey pieces and sticker autos.